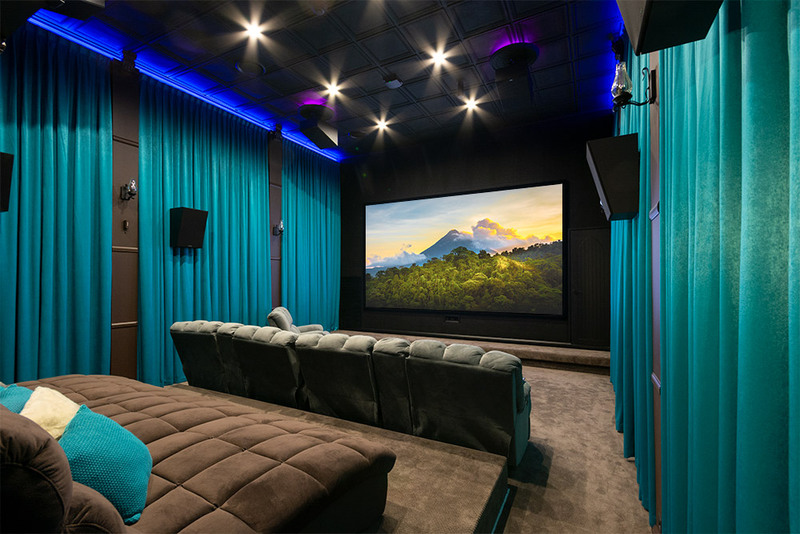 When it comes to do-it-yourself home cinema renovations, there’s few that can match the scale and wonder of this Series X home cinema, converted from a 19th century church into a high tech movie and gaming paradise. Built in 1896, the bluestone church was used for over 110 years until the church and accompanying land were put up for sale. 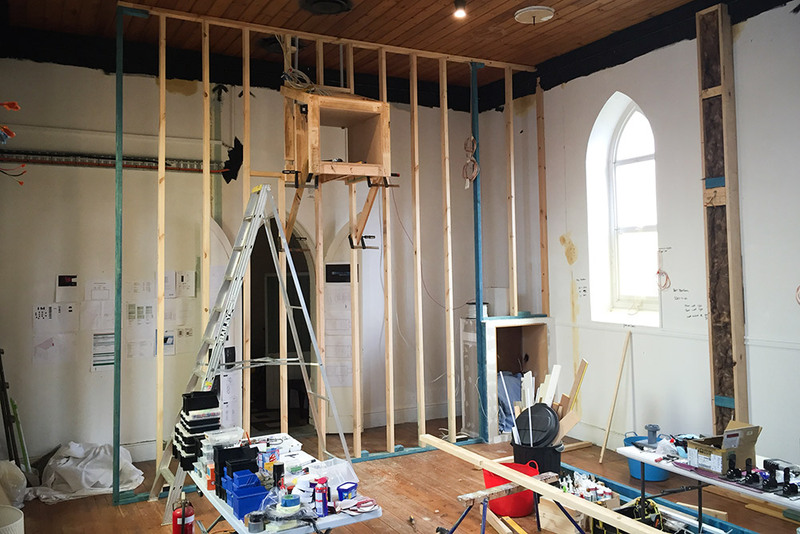 With future plans to convert the church into a home cinema, Matt and his wife Kate purchased the land and lived in the church for two years while their house was built on the adjoining block. 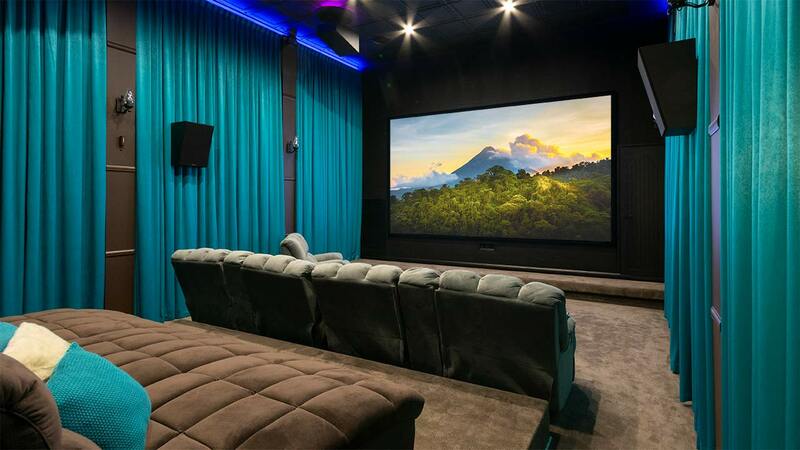 Rolling forward to 2014 and with the family house completed, Matt then turned his attention towards his ultimate goal – a home cinema fit for the gods. 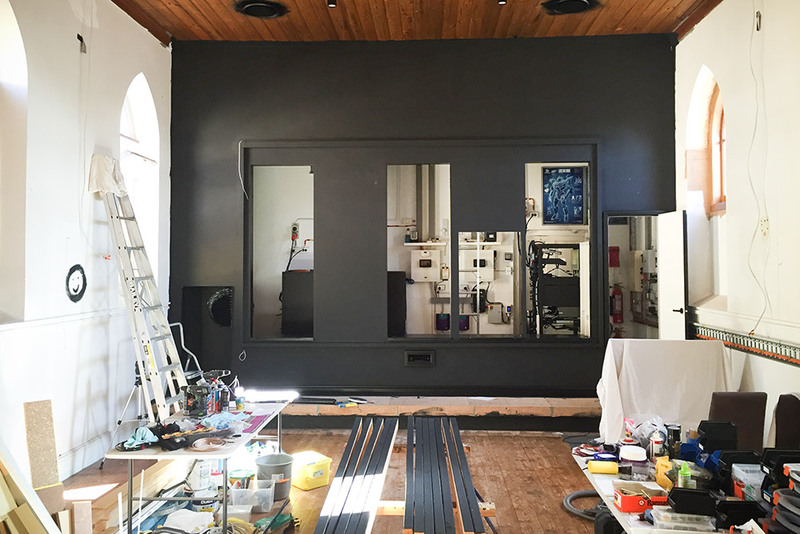 With experience from a previous custom home cinema build and with Kate handling the interior decorating, Matt already had a distinct idea of what he wanted to achieve – and he wanted to achieve it predominantly using his own labour and time. No mean feat for a home cinema the size of a church. 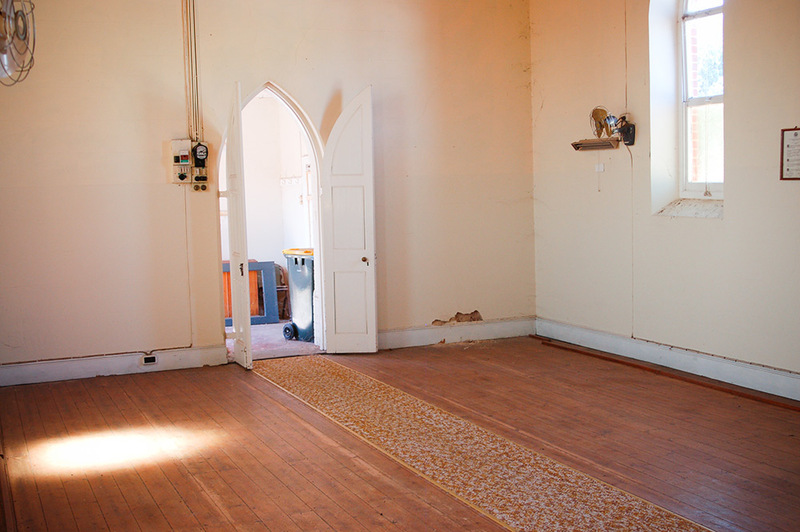 The very start – a bare-bones view of the church interior. ‘Minty’, the family dalmatian checking in on progress. Construction beginning on the back wall with projector housing. 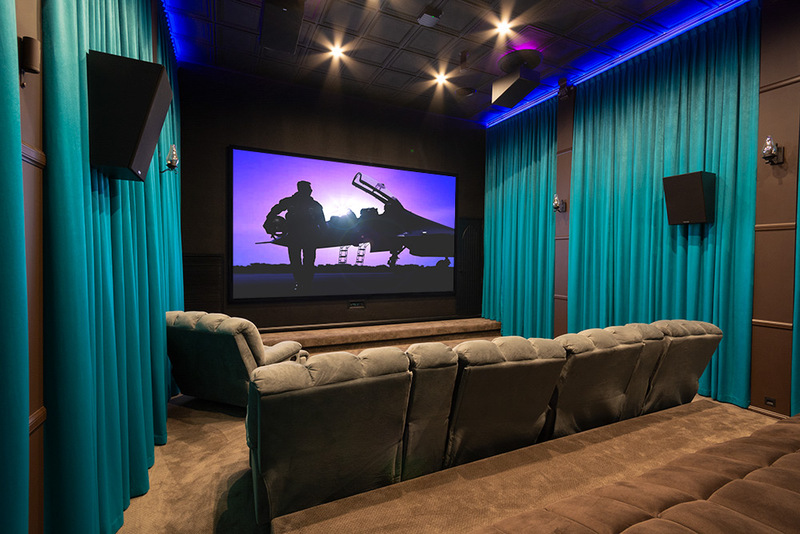 So what did Matt set out to achieve for the ultimate home cinema room? Being a huge movie buff, Matt wanted an enormous picture and immersive cinema sound for a one-of-a-kind experience. 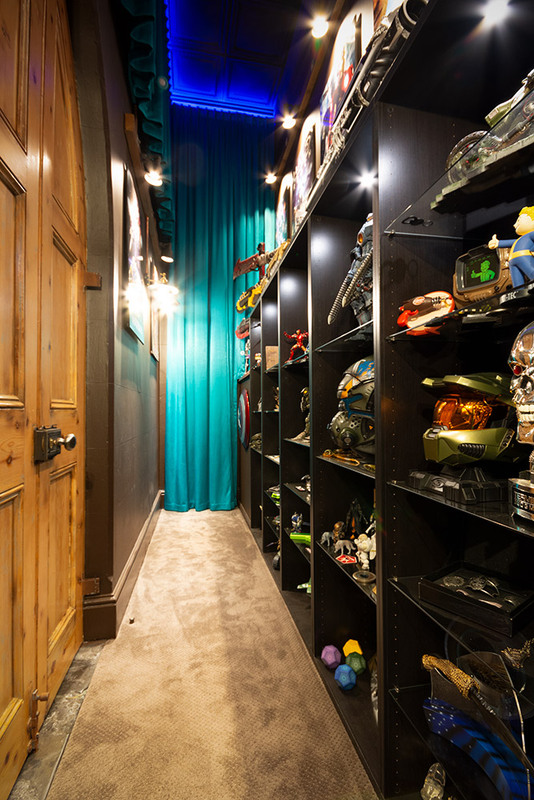 This experience would also go a long way into realising the second, equally important criteria – to function as a gaming system for this Xbox family to play into the early hours of the morning. 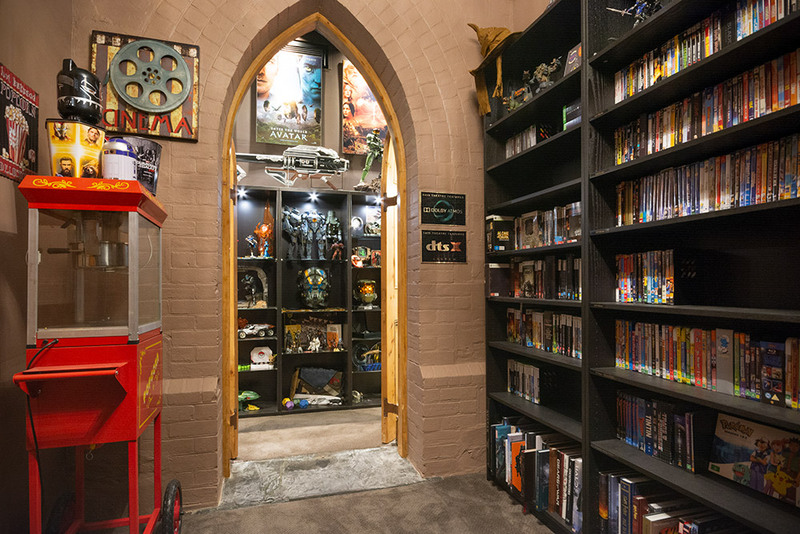 Aside from the audio-visual requirements, the church needed to have areas to display Matt’s movie and game memorabilia, store countless UHD / blu-ray discs, as well as an area to store the processors, amplifiers and electronics that would drive the system. The room control needed to be hassle free and easy to use, from switching the air conditioning on, to adjusting lighting and ultimately controlling what was being played in the cinema. It also needed to be comfortable… warm, inviting and accessible. 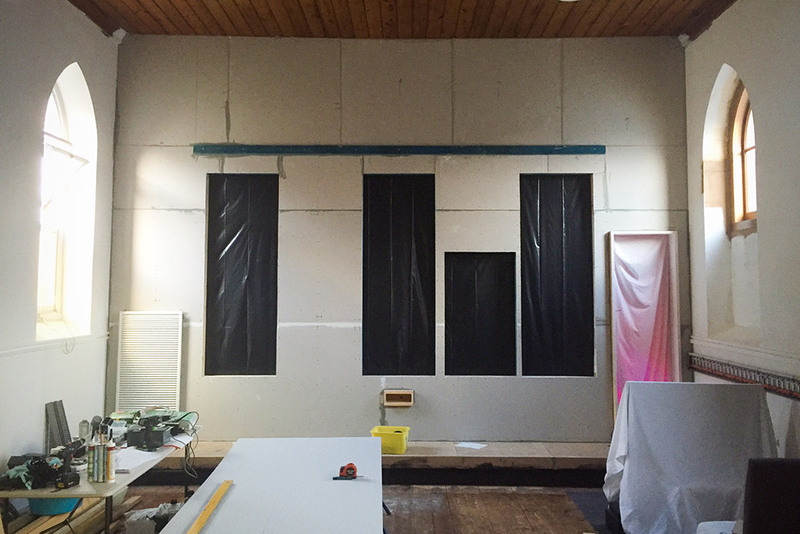 Front false wall construction, with space for speakers and equipment racks behind the screen. The false wall was constructed using 90x45mm studwork, glued, screwed and covered with one layer of 16mm MDF, two layers of 13mm plasterboard, then covered with acoustic material. Front wall painting done, complete with motivational smiley face. 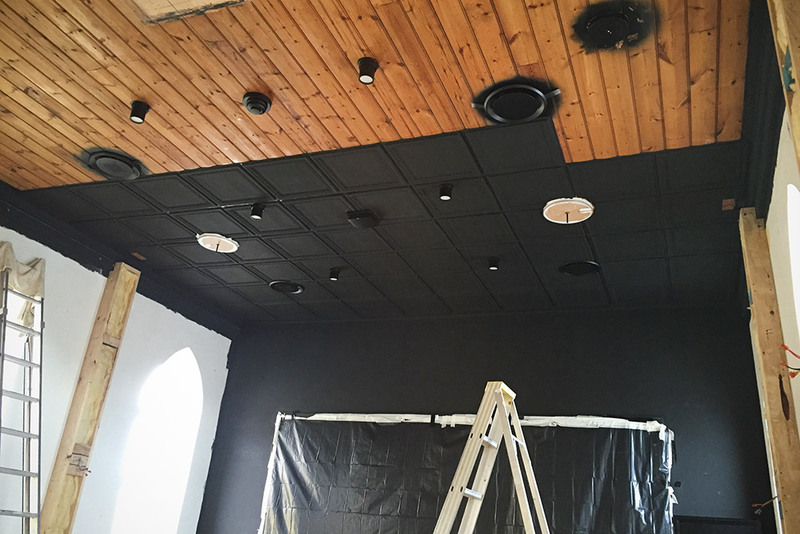 Matte black pressed tin panels tie the ceiling in with the rest of the room. Unboxing the Series X Cinematix and Cyclonix for installation into the front baffle wall. The finished baffle wall. Scott Krix introduced the concept to cinemas in the early 1980’s and it is still used by cinemas worldwide today. After experiencing the system in person… there’s no denying that fact. 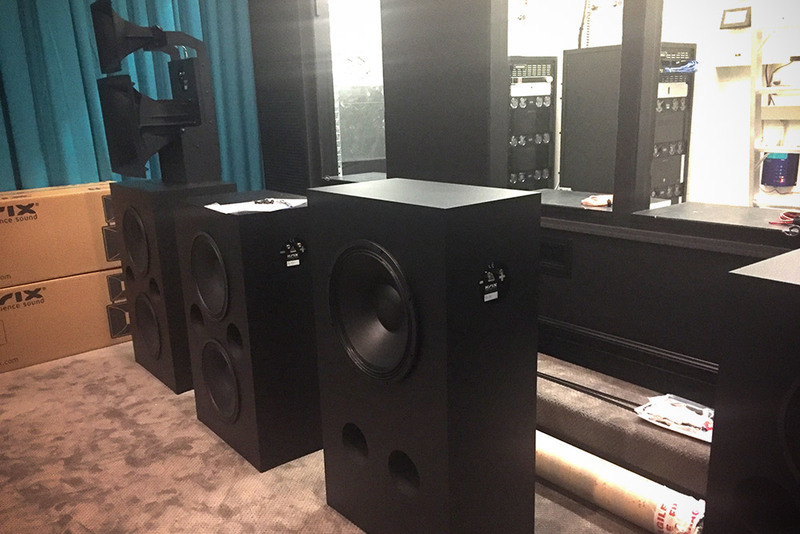 Sometimes, after hearing many speakers in smaller environments, it can be easy to forget just how much presence these beasts have in even the largest of rooms and auditoriums. 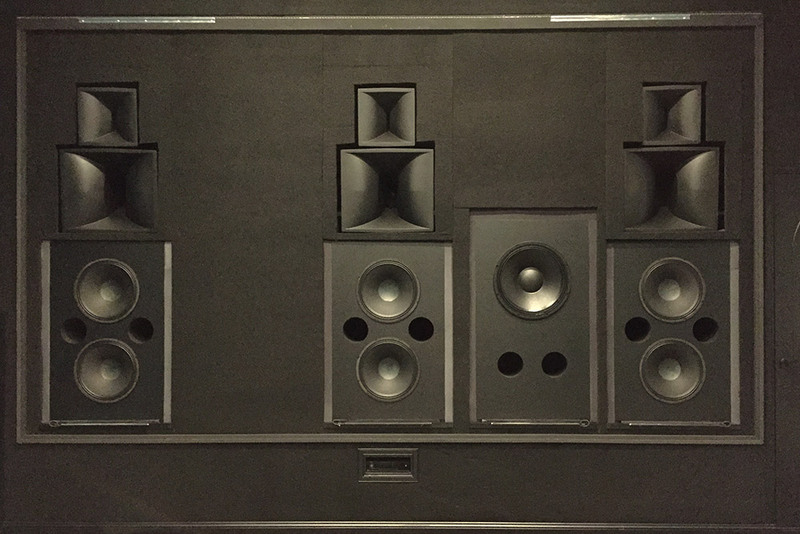 Pairing the Cinematix with dual Cyclonix (front and rear) and ten Megaphonix surrounds, Matt was able to create a 7.2.4 immersive sound system capable of delivering crazy amounts of sound from every direction. There’s much to be said about having a larger dedicated space to deliver that true cinema sound. The finished room, looking from the back of the cinema. Gaming played a large part in the design of the cinema. During the build, Matt needed to ensure all cabling was run exactly where it needed to be. As many know, it’s a painstaking process to start cabling in a finished room, let alone a room of this size. 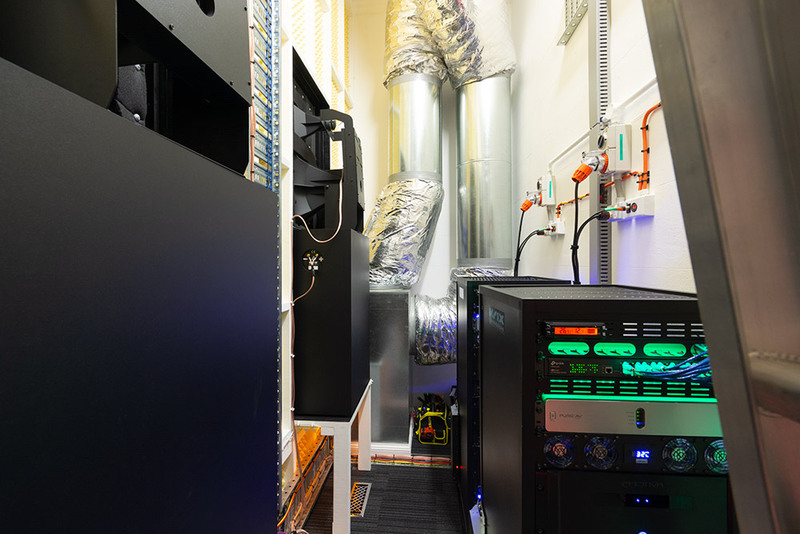 To that end, 100 metres of cable tray and 3 kilometres of cabling were installed to service power, speaker, subwoofer, lighting, fibre optic and lighting requirements. Sensing just how much work the cabling alone took, we asked Matt what the biggest challenges were when undertaking the build. Unsurprisingly, height was the main answer. 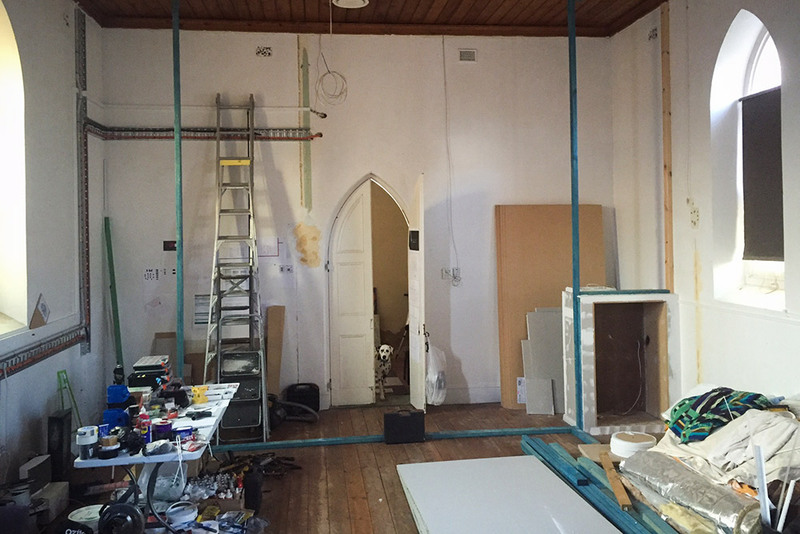 With a 4.5 metre ceiling, progress at times was slow and frustrating. Time also played a large factor. Balancing work, family life and the church build meant that progress could sometimes be slow. The cinema is used for movies, gaming, free to air TV and even internet browsing and Youtube videos. There’s seats for up to 11 people, the back row elevated with a riser. Due to the length of the build, Matt was also concerned that some of the components his cinema was built around might be superseded or updated by the time the cinema was finished. Conversely, he was relying on affordable projector technology that didn’t exist at the time. The foyer leading into the cinema houses all the source material and extra memorabilia. A vintage popcorn machine adds to the atmosphere – it gets used often! 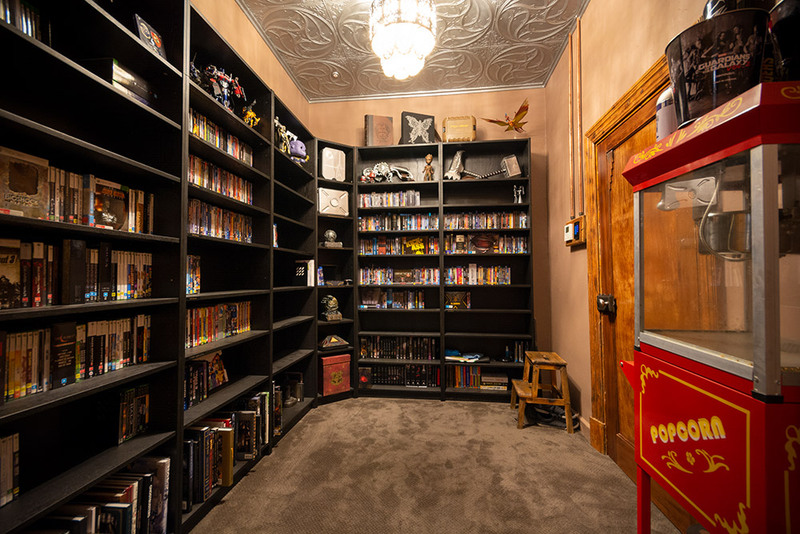 Movie and game memorabilia line the entryway. The Avengers, Halo and Gears of War fill a good portion of the collection. You may be wondering what the neighbours think about the sound coming from the ‘church next door’. Fortunately for them, the walls are made of half-metre thick stone with 12mm glass in all windows. Every wall, ceiling and floor cavity is stuffed full of sound deadening material and insulation. So, while it looks like a church from the outside, passers-by are unaware of the formidable setup within. 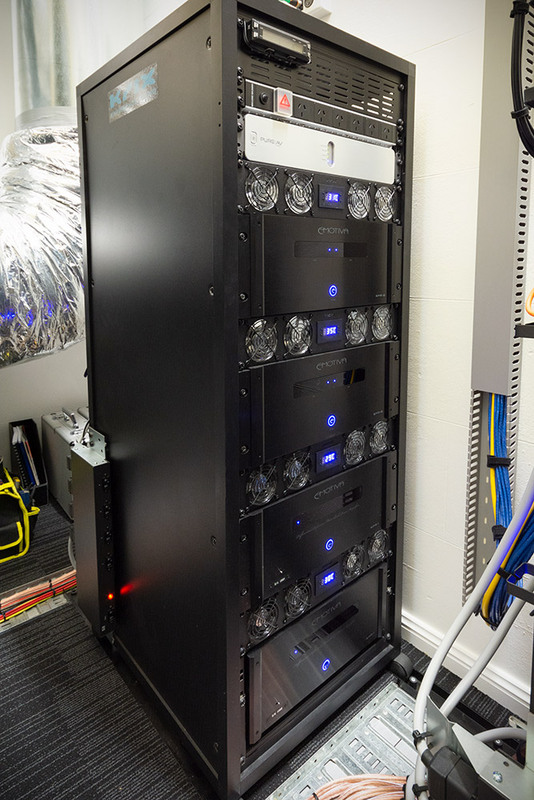 As you might imagine, the complete setup has the potential to consume a lot of electricity. Wanting to offset the environmental impact, and sensing the pain of the forthcoming electricity bill, Matt had an 8kW solar system and battery hybrid system installed. Lucky then, that Matt has around 5kW RMS of amplifier power at his disposal for when things really heat up! Behind the screen. You can see the backs of the Cinematix enclosures to the left. 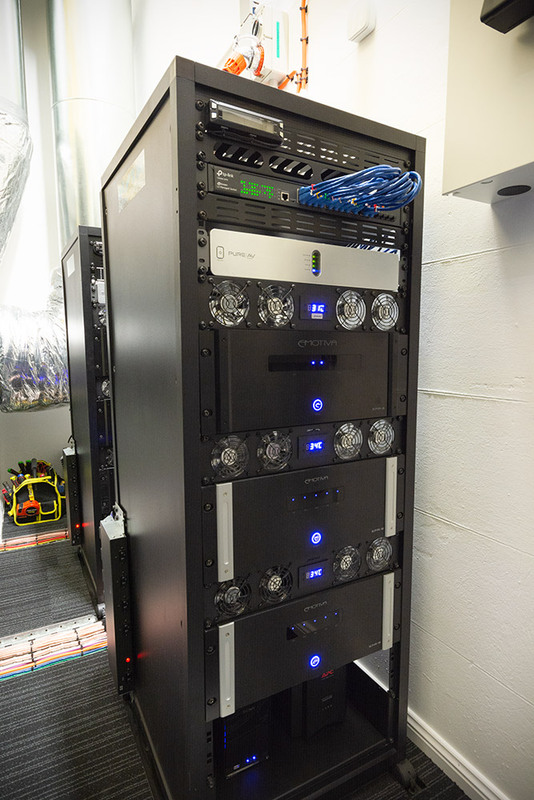 Two of the three AV racks, housing amplifiers, power conditioners and network switches. 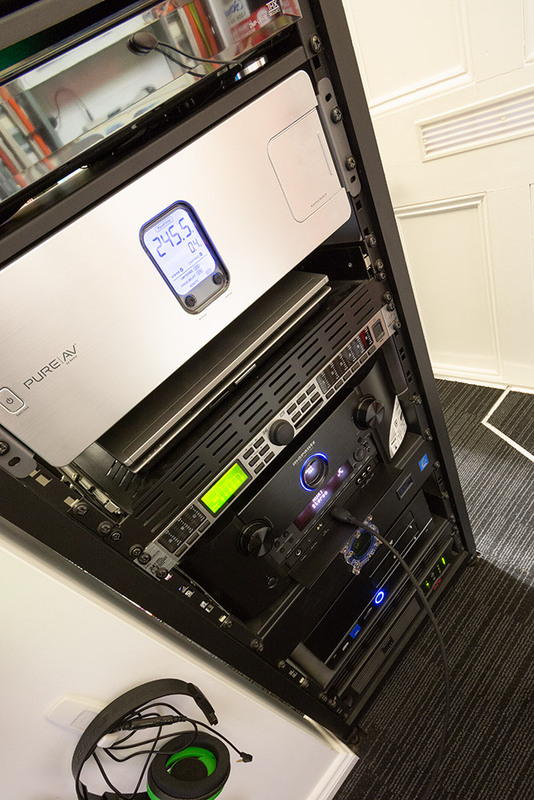 The main processing rack houses the processors, players, game consoles and servers. 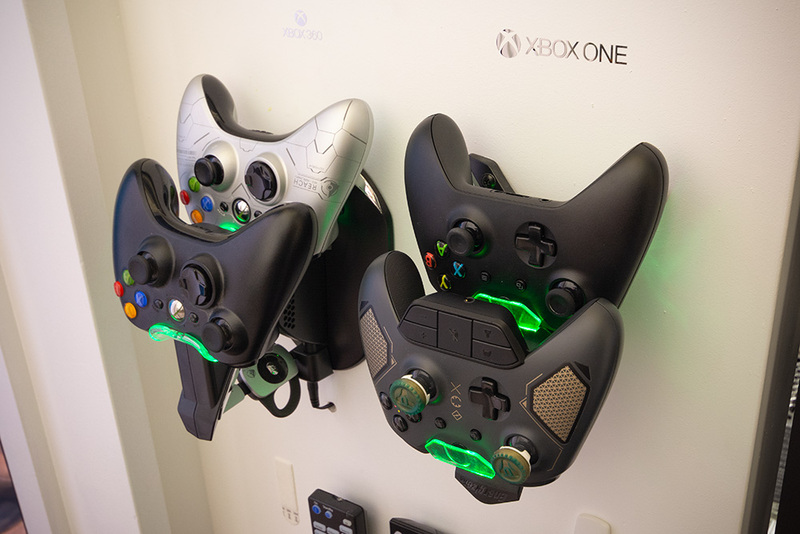 A custom charging rack for the Xbox controllers. All up, the build took 3 years to complete. As he had hoped, Matt was able to complete almost all of the work by himself and in his own time. 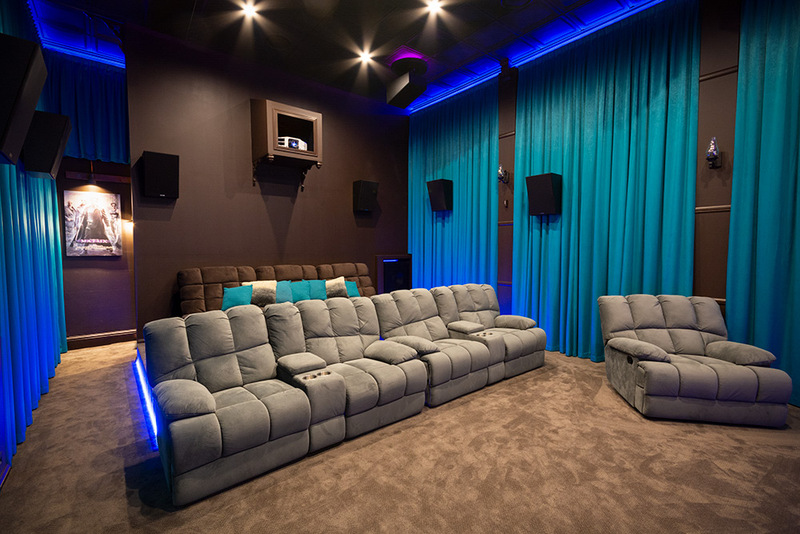 After looking through the foyer, cinema room and behind the screen, we were amazed at the level of care and detail. 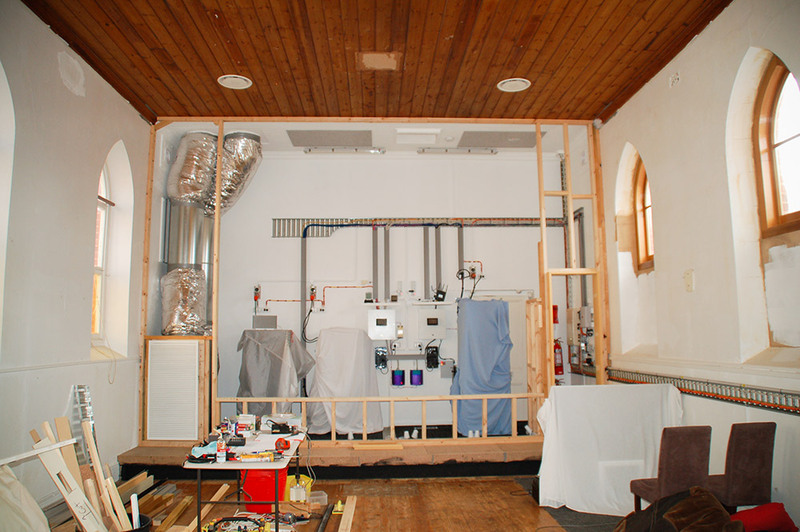 Not only in the technical aspects of the install, but also in the care taken in staying true to the original style of the church. Cathedral arch doors, architraves, styled wall sconces and corbel trim add charm and pay homage to the history of the building. While we were there, we were lucky enough to be given a range of movie and Xbox demonstrations, starting with the first scene from Fate of the Furious and ending with the ever-entertaining sovereign fleet chase scene from Guardians of the Galaxy 2. Matt’s plan had come to fruition. 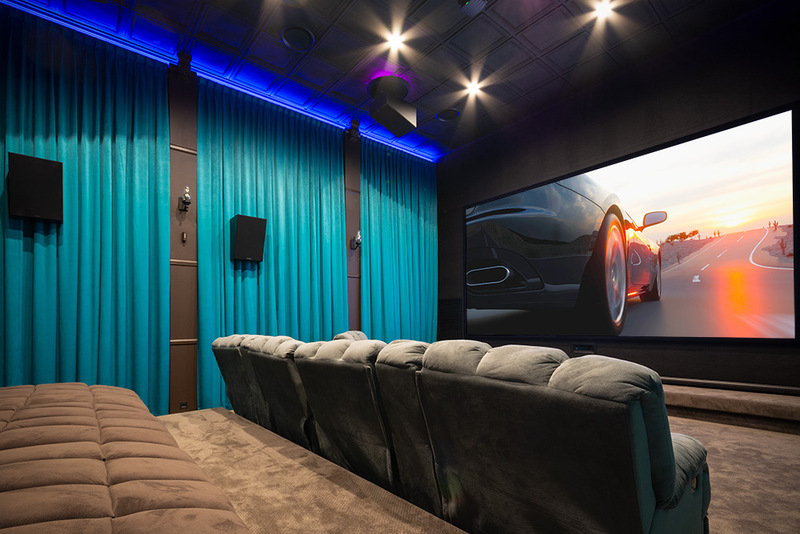 Every design choice and piece of equipment combined to provide a visceral experience that rivaled and even outperformed that of some of the best cinemas we have been to. When asked the best part about the build, Matt’s answer was simple; “Seeing my vision come to reality”. With years of time and effort culminating in a cinema experience of that level, we can wholeheartedly see why.